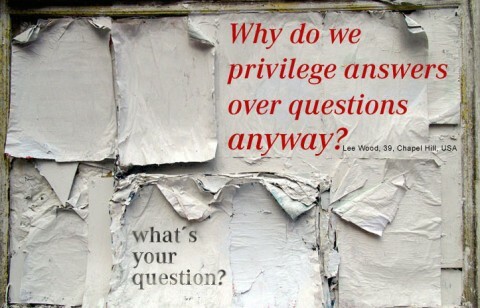 The process of empowering the question provides opportunity for the world to see the questions of people not often included in the democratic process. By sharing the questions and knowledge of people often excluded from public dialogue, we are both giving them another vision of themselves and their thinking, plus we are creating opportunity for the broader public to learn from them and see them in a different light. Reflecting on what we want, understanding our shared aspirations, is an integral part of actually attaining our goals. When we skip this part of the process we tend to do what we’ve always done. Nothing new happens. It is by coming together that we move from “the story of I” to “the story of Us.” Foreclosure can be experience as a shameful event by a family losing their home or it can be experienced as a systemic agression by a large group of people realizing they have become the chips in a global banking casinos. Coming together gets us in touch with our shared story. We don’t have to come together and come up with a master plan allowing us to address critical questions. Planning gets big, unwieldy and boring relatively quickly. What we can do is identify a diversity of smaller experiments. Experiments within a range that allows for failure, and learning from failure. It’s about taking small, smart, iterative steps towards our desired future. It is about learning by doing. A question campaign that is linked to these ideas can become a more effective way to create the future in the context of complexity.